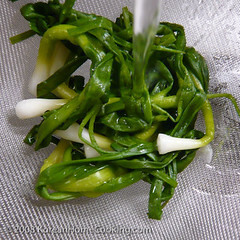 When scallions are abundant, the simplest way to prepare them is a quick steam in hot water. This technique softens the spiciness of scallion and brings out the very best of its flavor. And just dip it in vinegary chili paste or your favorite sauce. Peel, wash scallions, and cut off the roots. 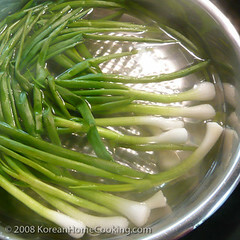 Cook/steam scallions in hot water quickly. 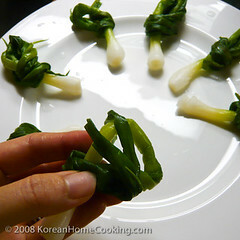 Tie a knot with each scallion and place around a plate. Dip in chogochujang, Red Chili Vinegary Sauce. I remember when my mom would make these growing up. 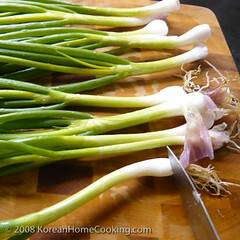 I always thought they were something special cause she took the time to tie the scallions; which she grew in our garden. 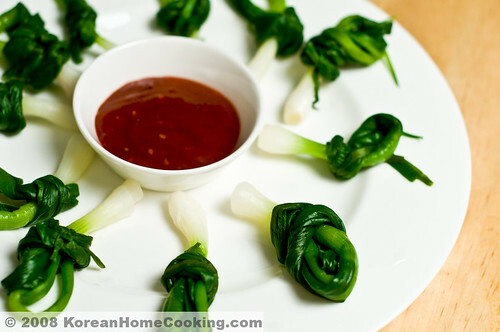 I've been thinking about this banchan lately, I'm so glad I came across this post.